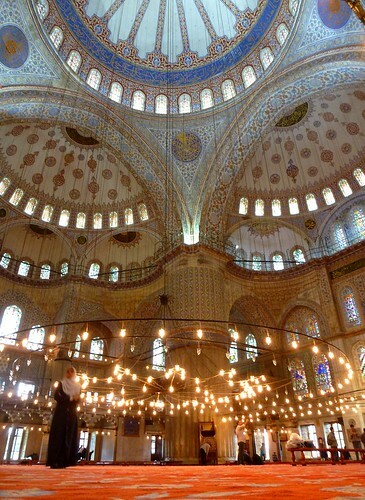 Istanbul has so many things to see, we could easily spend months here and never be finished. One of the first must-see items on our list was the Sultan Ahmed Mosque, which is more famously known as the Blue Mosque. The nickname comes from the multitude of blue tiles that adorn the inner pillars and domes. It’s one of the most beautiful buildings we’ve seen on this trip, and we walked out with dozens of photos of the interior mosaics. Very cool. Will you be posting any more pix? Definitely at some point! We have so many pictures from Istanbul that we might just do a photo post. Otherwise, we’ll get them up on flickr when we have faster internet and I’ll send you the link. Excellent shot. I don’t remember so much light in it. They must have added this lately. Ah Istanbul is one of my favourite cities. It was stunning, as were most of the mosques we’ve visited so far. We fell in love with it pretty much immediately, it has such a great combo of east-meets-west! Never saw anything so awesome….thank you for sharing and am looking forward to more pictures and more of your travels…..